these indices through a software. The RDIT software application can perform and run the eight rain-based drought indices in a user-friendly tool. By plotting various graphs, this software can help to the users for better interpreting the results. What Is Severity Of Drought? To advance the understanding of monitoring and investigating droughts in the past, it is crucial to assess drought frequency and severity. Each drought is defined in drought duration, drought severity, and drought interval. The onset, the end, and the severity of the drought are important features of drought monitoring. If the user wants to indicate the value of severity, actually it is not an easy process. It is so important when the user wants to analyze the severity of drought. 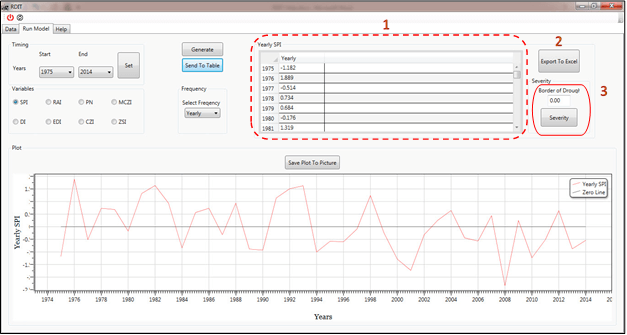 In RDIT software, the user can easily calculate and plot the amount of severity. Drought, Climate, Weather, RAin-based Drought Indices This software calculates SPI (Standardized Precipitation Index), DI (deciles index), PN (Percent of Normal Index), RAI (Rainfall Anomaly Index), EDI (effective drought index), CZI(China-Z index), MCZI (modified CZI), ZSI (Z-Score Index).